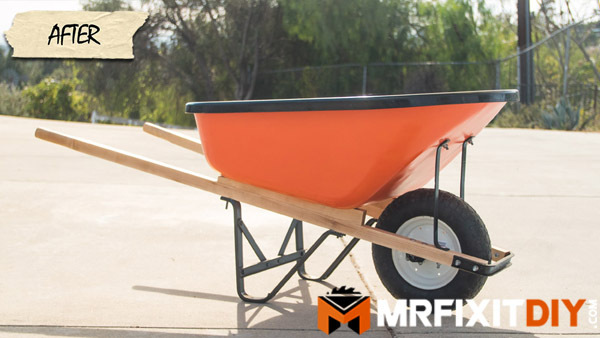 In this project tutorial I’ll show you how to restore a wheelbarrow by taking an old pile of rusting wheelbarrow parts and transforming it into a fully functional wheelbarrow that’s as good as new! When I moved into this house I found a bunch of old wheelbarrow parts rusting away in the backyard. Rather than tossing them in the dumpster, I knew I wanted to restore it somewhere down the line so I’ve been holding onto it for a few years until I could get around to it. 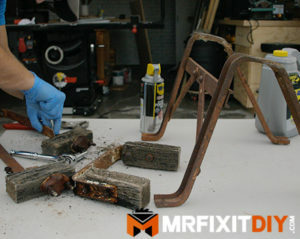 Most of the wheelbarrow parts are actually in pretty good shape with the majority just being surface rust. Sure I could just buy a new wheelbarrow if I wanted to, but where’s the fun in that? You know the old saying, one man’s trash is another man’s wheelbarrow! 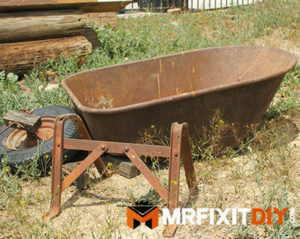 Before I could do much with this wheelbarrow, I had to start by taking off all that surface rust which was a pretty big task in and of itself. 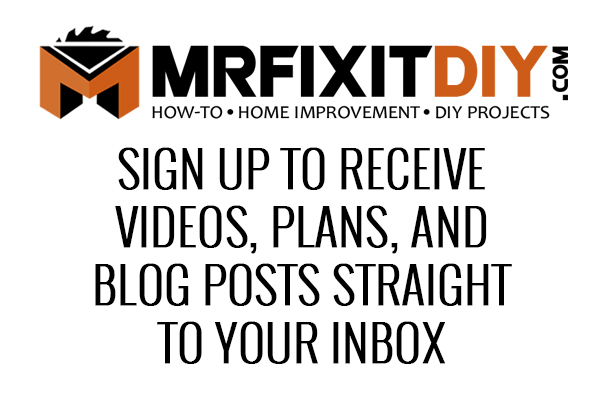 I started by soaking all the smaller components in WD-40 Specialist Industrial-Strength Cleaner & Degreaser and used some WD-40 Specialist Rust Release Penetrant Spray to loosen up the old rusted bolts on some of the hardware. 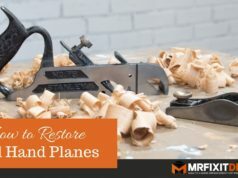 I had to do a little persuading with the old parts to get them apart which involved me just smashing the old wood with a hammer, but once they were all apart I could let them soak for a little while. In addition to the legendary blue and yellow can, WD-40 Company has a full range of high performance products for maintenance, repair, cleaning, and industrial applications for all manner of enthusiasts, professionals, DIYers, and homeowners. 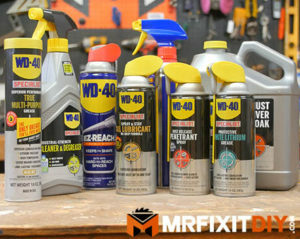 To see the full range of their products, check out their website at www.wd40.com. Next I could focus on the tub itself. 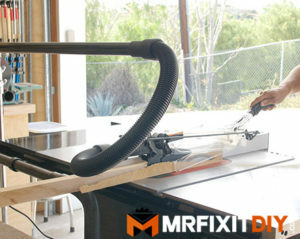 This would’ve been a great task for a sandblaster but since I don’t have one I used a flap disc on my angle grinder for the majority of the removal. 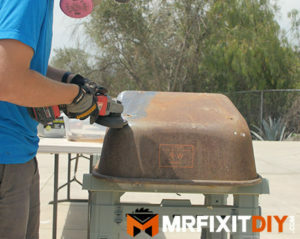 I also used some low grit sandpaper on my orbital sander, and a wire brush attachment on my drill. It took a while to get down to the bare metal on the whole tub. And then once the tub was done, I had to do the same thing to all the smaller hardware components! Finally, after a whole bunch of grinding and sanding, I had all the pieces brought back down to the bare metal and ready for primer. 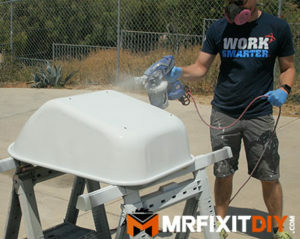 I sprayed the whole thing with a few coats of rust sealing metal primer with my Graco Paint Sprayer. 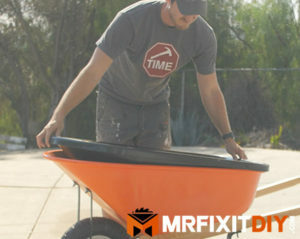 Originally this wheelbarrow was blue, which I didn’t know until I started sanding it down but since I’m redoing it, I decided to make it a little more “On Brand” this time around and painted the tub a bright orange. I couldn’t find the orange color for my sprayer so I got stuck spraying the whole thing with the trusty old rattle can method. For the hardware components, I decided to make those all black so I sprayed them with a few coats as well and then sealed the whole thing with a few coats of high gloss clear coat. While all that set up, I started in on the new handles and wedges for the wheelbarrow. 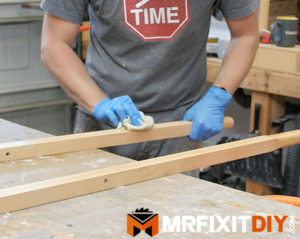 I started by milling down some hard maple that I had lying around into long rectangles for the handles. Normally I probably wouldn’t use maple for this because it’s a pretty nice hardwood for a wheelbarrow that’s gonna get some abuse outside but I wasn’t about to go buy something else. And yes, I could’ve bought pre-made handles too but again, Where’s the fun in that? It’ll just be the nicest handled wheelbarrow around when it’s done. 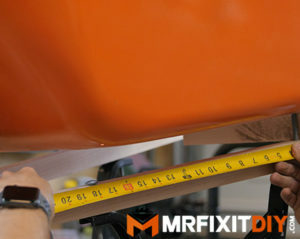 The handles ended up being about 61″ long by 1.5″ thick. 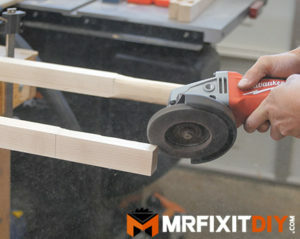 When it came time to shape the handles I wasn’t really sure how I was gonna do it but I decided to try and just use the angle grinder and the flap disc since I used it for just about everything else and it worked out great. 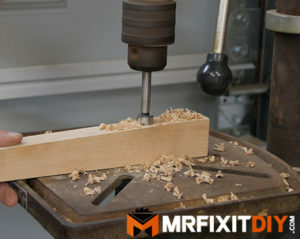 I was able to rough shape them into something that was pretty ergonomic and then finish them off with some sandpaper. Then I started figuring out where the hardware was going to line up on the handles and drilled some holes in them. In hindsight, I should’ve done all the rough assembly first before I primed & painted everything just so I wouldn’t beat up on the paint job so much wrenching on it and moving it around. 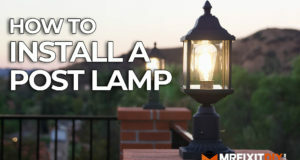 But I figured if it can’t hold up to being put together and taken apart of bunch of times, then it won’t hold up to much abuse anyway down the line. Since I didn’t have any old parts to base the wedges off, I didn’t really know what the angle needed to be or how long they needed to be so I rough assembled the wheelbarrow to try and get a sense of how it was going to be so I could figure out how to make them and also where the wheel was going to fall. The old wheel was pretty dry rot so I did end up spending money on a new one and decided to go with a solid rubber tire. I also bought new glavanized nuts and bolts to hopefully stop the rust from happening again down the line. 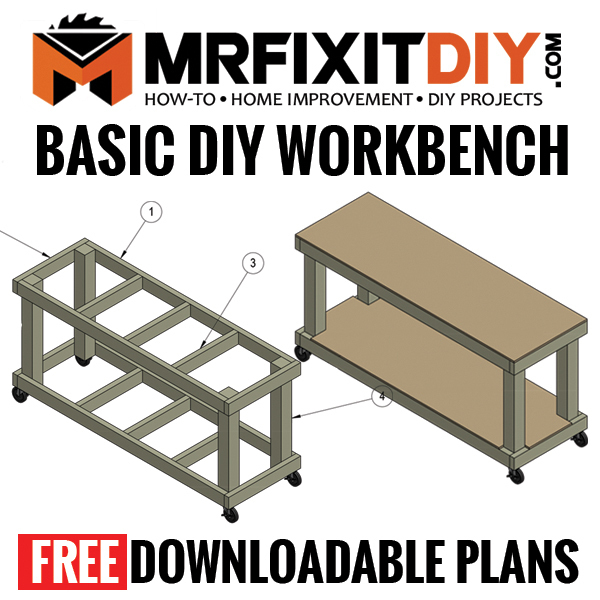 Once I had an idea of what to do for the wedges, I cut them on the table saw and then used the drill press to mortise out some holes so that I could have an area to adjust them if I needed to which ended up working out pretty good. The finished wedges ended up being 19″ long by 1.5″ wide and tapered from 1 3/4″ to 1″. I didn’t do the math on the angle. Before I did the final reassembly of everything, I wiped down all the maple with a couple coats of Danish oil (I said Tung Oil in the video but I actually used Danish Oil) finish to help it withstand the outdoor elements. I’ll have to reapply down the line but for now a couple coats should be fine. I’m pretty sure there was an easier way to get this thing back together than the way I did it, but after a bunch of messing around, I finally got it all put back together and tightened down. 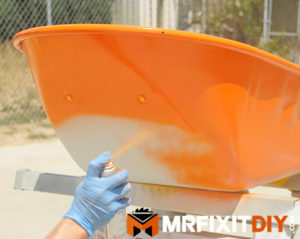 I added one last thing to this wheelbarrow and that is this wheelbarrow liner insert to try and keep the paint job on the inside of the tub intact for a little while and hopefully protect it for a little while. These are manufactured by a local company and one was sent over to me to test out so I figured I’d give it a shot and see how it works out. Well that is it for this project! I hope you guys enjoyed it. 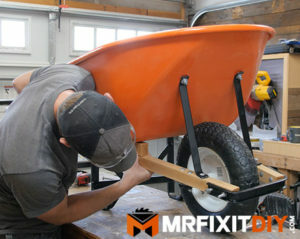 I know I had a ton of fun bringing this old wheelbarrow back to life. It’s not something I do very often so it was a fun little restoration challenge and I’d definitely like to do some more of it down the line. 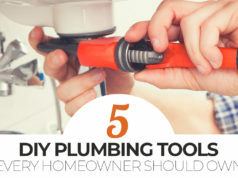 I want to say a quick thank you to WD-40 for making this project possible and I encourage you guys to check out some of their new line of products for your DIY and home improvement projects at http://www.wd40.com/. 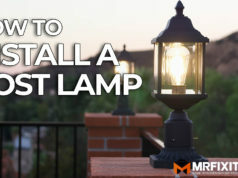 If you liked this project, consider checking out some of these other outdoor DIY Projects!